This past winter, my holiday Swiss Colony catalog came in…and with it, their Gluten Free and Sugar Free catalog as well. I usually never purchase anything for myself from Swiss Colony…but I was paging through and saw these new cookies they were offering…Gluten Free Mint Slims. The photograph looked all the world like what was, once, my favorite Girl Scout Cookie – the Thin Mints. The description in the catalog read: Refreshing mint cookies with a chocolatey coating are sure to be a family favorite! I said, “OHMYGODGLUTENFREETHINMINTS!” And I placed an order. 12 ounces of cookies…for $19.95+tax. They weren’t going to ship until January 19…so I had a bit of a wait…but one day, my beloved Swiss Colony box arrived at my office and I tore into it…finding two bags (each 6 ounces) of Mint Slims from a company called Goodie Girl Cookies. Well, regardless, I ripped into the first bag and dug in. And then shared some with a select number of people in my office. And that was that. I think it wasn’t what I was expecting to arrive. And now that I am getting around to a review (as I opened up bag #2 yesterday), I find out that these bags are available on the Good Girl Cookies Website for $4.99/bag. So, yeah…I feel a bit cheated. Not by Goodie Girl…but by Swiss Colony. However, what is done is done. And now you have the long and rather unfortunate tale of Swiss Colony’s betrayal and cheat tactics. So, let’s get down to the Goodie Girl Gluten Free Mint Slim Cookies, shall we? Goodie Girl Cookies is based out of Tribeca, New York, specializing in creating gluten-free cookies with surprising flavors, as well as exciting twists on cookie classics to evoke memories of childhood. Founder, Shira Berk, also a mom and native New Yorker, began her journey to create an all-natural, super-delicious line of cookies that are all gluten-free back in 2010. Her intention was to create cookies that were intended for anyone to eat, but still be accessible to the 30%-and-growing number of population who had to avoid gluten. What began in a home kitchen soon grew to be made in a kitchen incubator in Queens, then to another one in Brooklyn, until now, where Goodie Girl Cookies now produces their gluten-free cookies at a contract bakery in Long Island, New York. An interesting aspect, I would like to point out, is that neither Berk, nor anyone in her family is Celiac, gluten-intolerant, or in need of a gluten-free diet. Berk And they not only loves to bake, but has created serious buzz around these cookies. Specifically…the Mint Slims…or their take on the infamous Thin Mint Cookie from those little Girl Scouts. Growing up, Thin Mint Cookies were my favorite treat. And as a Girl Scout, we ordered a bunch of boxes all the time for my family. It was the only flavor of Girl Scout Cookie you would find in my house. Ever. There were no others. So, for the past three years, since going gluten-free, having to bypass the Girl Scouts at the local grocery store has been heart-wrenching. I see that green box and it’s all I want. And thanks to Goodie Girl Gluten-Free Cookies…(and for Swiss Colony for now introducing me to Goodie Girl)…they’re back in my life. 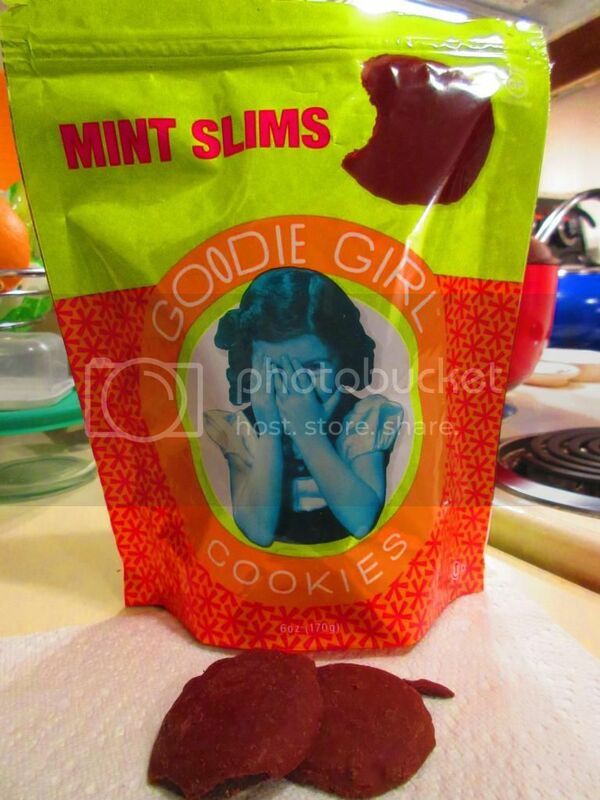 The Goodie Girl Mint Slims are crunchy, just like the Girl Scout counterpart. They have this amazing mint flavor that may rival that of the Girl Scouts for sure. The coating, for me, however, just was wrong. It didn’t have the richness that the Girl Scout Thin Mints have. But, that’s also me, who prefers dark chocolate to mint chocolate any day, so…it’s more of a personal thing than anything. Other than that…these are spot on. I had one co-worker wrinkle up her nose when I offered for her to try one, and when she did, she admitted that they tasted just like the Girl Scout Cookies. Never count a gluten-free copycat out. EVER! Sometimes…they are just as good if not better as the original. I count these as just as good. Seriously…it hits all the right notes. The Goodie Girl Gluten Free Mint Slim Cookies are made from chocolate coating (made of sugar, palm kernel, palm oil, cocoa processed with alkali, nonfat dry milk, soy lechithin), sugar, butter, the Goodie Girl Flour Blend (white rice flour, corn starch, tapioca flour, brown rice flour, powdered milk, potato starch, and xanthan gum), cocoa, whole milk, vanilla extract, pure peppermint flavor, baking soda, and salt. They are…just the right amount of wrong. In a good way. A very rock ‘n roll way. As for nutriton, let’s keep in mind that these are cookies, shall we? The Goodie Girl Gluten Free Mint Slim Cookies come in a serving of 2 cookies (with 6 servings per bag). Each serving will give you 160 calories and 9 grams of fat. These two cookies will also provide you with 10 mg cholesterol, 35 mg sodium, and 12 grams of sugar. These cookies also provide 1 gram of fiber and 1 gram of protein, meaning they make a perfect non-filling dessert or snack. Granted, with Girl Scout cookies you get to eat 4 cookies for almost a perfect match in the nutrition area…but beggars can’t be choosers, can we? I just think the Girl Scout cookies are a bit thinner, maybe less dense on the filling as, weight-wise, a serving of 2 Goodie Girl Mint Slims is 30 grams and 4 Thin Mints from the Girl Scouts is 32 grams. Light bulb! If you are a gluten-free cookie monster…er…lover…like me, and if you have been missing those Girl Scout Cookies something fierce, I urge you to hop over to the Goody Girl Web site (not Swiss Colony!) and place an order for the Mint Slims…stat. Trust me…you won’t regret it. You’ll never regret cookies. Especially these. This entry was posted in Baked Goods, Chocolate, Cookies, Dessert, Food, Gluten-Free, Local, Products, Review, Snacks, Sweet Stuff, Vegetarian by The Celiathlete. Bookmark the permalink. I agree, they taste just like the girl scout cookies I always loved. Personally , I love the milk chocolate. More sinful than dark chocolate to me.